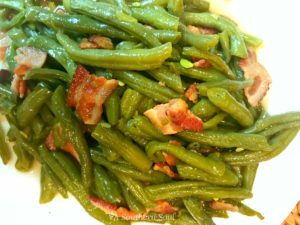 Fresh greens beans cooked low and slow with just a bit of smokey bacon bring back great memories of family suppers. 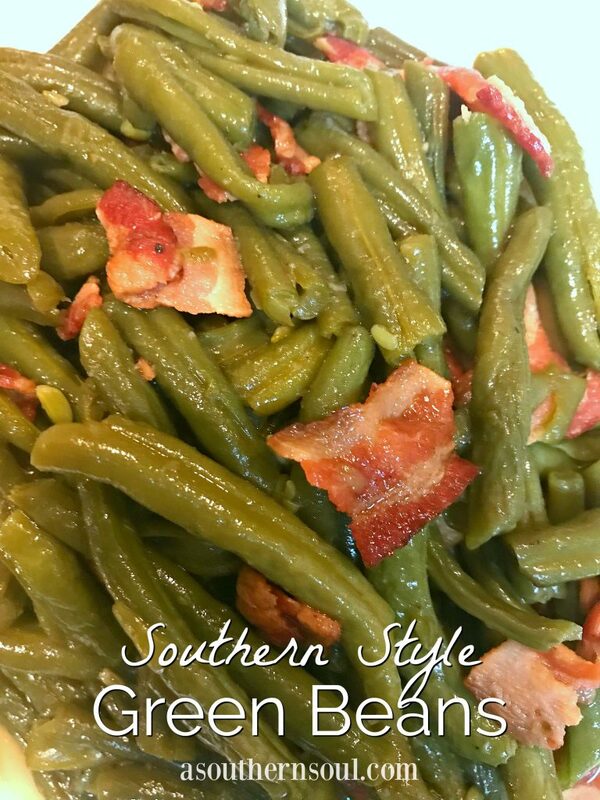 These “southern style” green beans are a tradition in many homes and are always at covered dish suppers and church picnics. I must admit, this is not how I cook green beans most of the time. I tend to roast or sautee them because my family likes them a little bit crispy. I’m somewhat impatient thus the reason for my faster cooking methods! Having said all that, there are times you need to head back to your roots. This recipe starts out with a layer of bacon flavor that’s the foundation for a great pot of beans. After that, all you do is add is a little vegetable stock, some seasoning and then…you just have to wait a bit. I picked up a “mess of beans” this past weekend at a local farm stand. 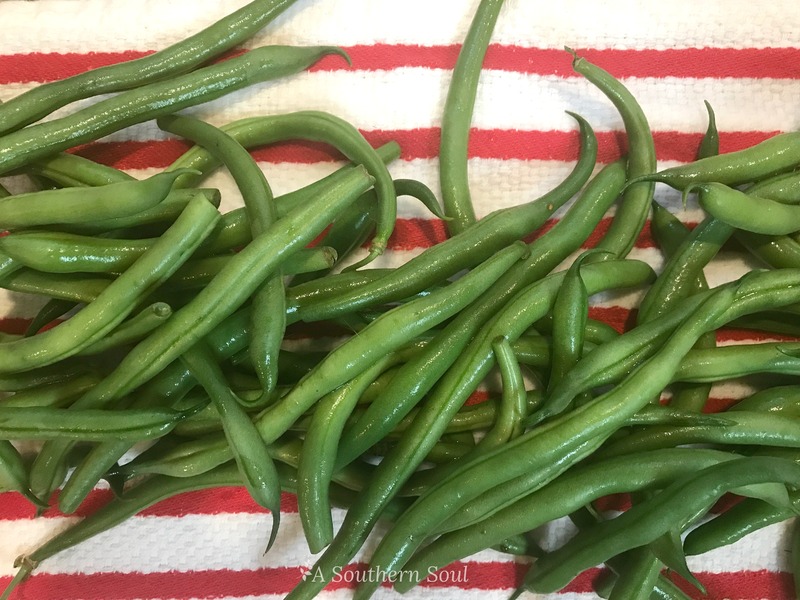 All I could think about was those lazy summer days when I was a little girl learning how to pick, snap and cook green beans. I would spend my days with my Mama Swain (my grandmother) and there were always vegetables to prep and cook for supper or for canning . Green beans were plentiful, so I received more than one lesson on how to cook them. So, last Saturday,with all those great memories swirling in my head, I grabbed my big cast iron pot and started cooking. 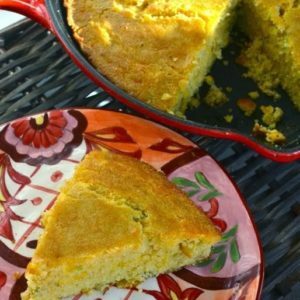 It was a good day, cooking a delicious, southern recipe that brought back feelings of a comforting, loving home. 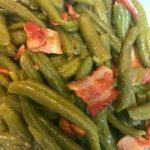 Green beans cooked low and slow in bacon are a Southern tradition. Cook bacon pieces in a heavy bottom pan until done. 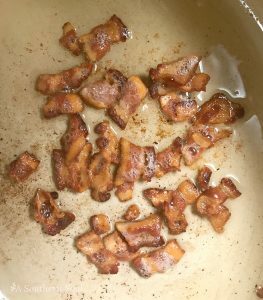 Remove bacon from pan and place on a paper towel to drain. Set aside. Add green beans to pan and cook on medium high heat. Toss beans in bacon drippings to coat. Continue to cook until beans turn bright green. Carefully pour in stock and add garlic powder, salt and pepper. Stir to incorporate. Add bacon pieces back to pot with beans. Turn burner to low, cover beans with lid - slightly off center and cook for about 1 hour until beans are tender, stirring every 15 minutes. Taste and adjust seasoning. Serve immediately. Nom nom this reminds me of childhood! I know, Paula. Brings back great memories for me too. I do them this way sometimes and they are great! My family likes them best with some finely diced onion cooked in the bacon grease before you put the “bean beans” in, as my grandbaby calls them. She loves her Nana’s bean beans! Sounds so good, Mama Jane. Thank you for stopping by. 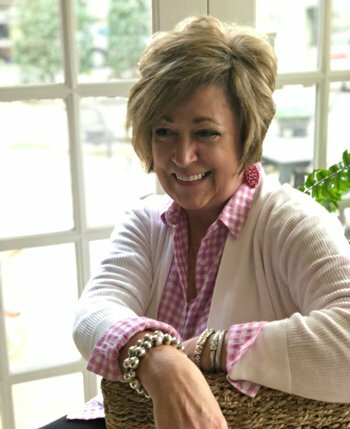 I love to hear from my readers and enjoy the stories of great food memories. 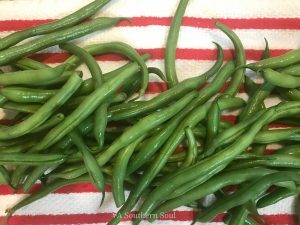 I use to love to help my mom snap “the mess” of green beans after we picked them out of the garden. I’ll definitely try this recipe. 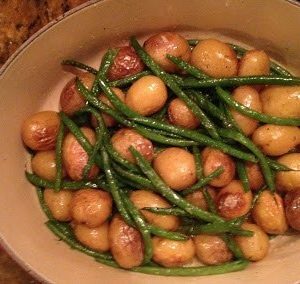 I’ve never been able to make anything as well as she did even though she never used recipes.. She would sometimes add new potatoes to her green beans. Thanks for the recipe! This is how I cook my beans most of the time….but if I don’t have bacon, I just cut up a whole onion and cook with the beans, add garlic, salt near the end of cooking, and maybe just a teaspoon of what ever oil I have….. they are better for you than with the bacon grease,,,,but I agree not as good tho….but still good….this is what I call country cooking….. 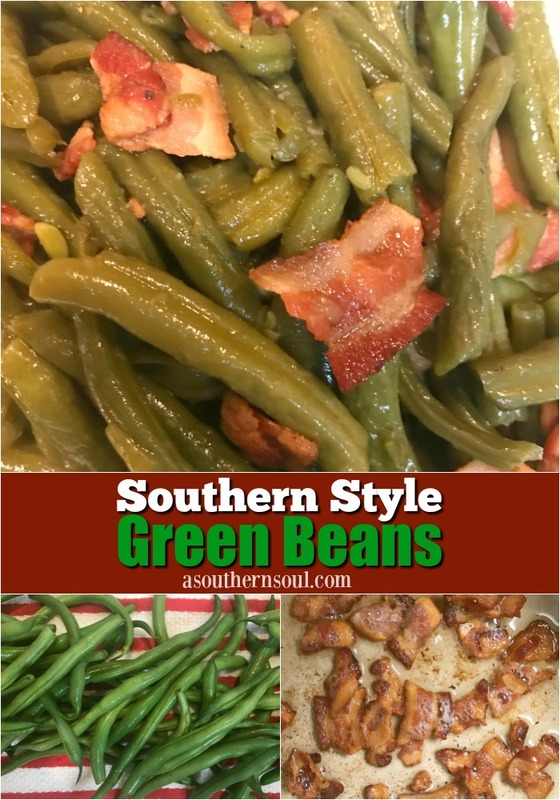 I don’t buy green beans in the winter….I only like certain kind of fresh green beans….have never cooked any that I liked in the winter….we use to can beans or dry them…but I don’t do that anymore….. I did dry a few strings of green beans couple of years ago….Do you know what those are ? they are yummy cooked….. 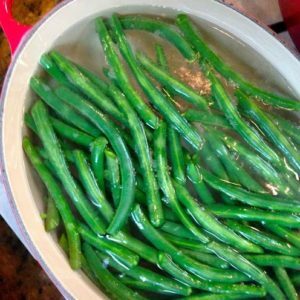 These are the green beans my family expects at Thanksgiving! It’s another of those recipes that brings out the “These are so good why don’t we have them more often?” comments. You are so right Daryl! My boys love these beans. They will be on my Thanksgiving table too. 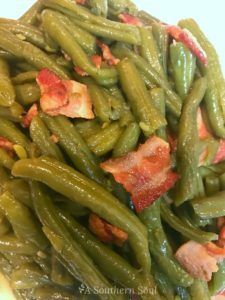 Pole beans are what you need for this recipe, with a longer cooking time, but pole beans are awfully hard to find. 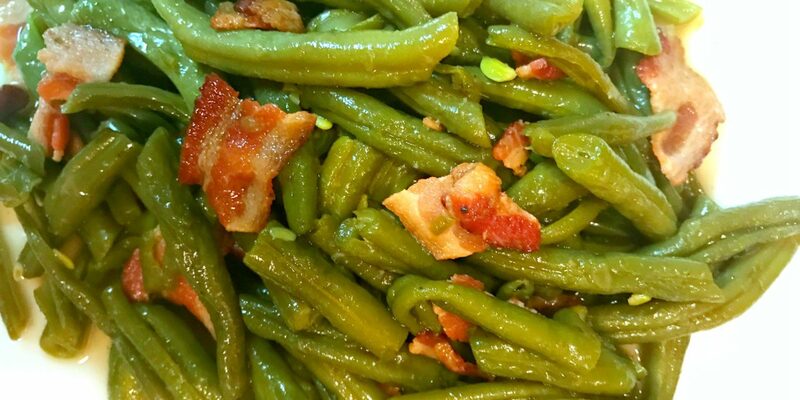 Grandma Ollis would die if you put garlic in green beans. I don’t think she ever heard of garlic, let alone used it in anything. I love to add a chopped up potato or two. Cook ’em down, put them in the fridge overnight (the potatoes absorb much of the bacon grease) and re-heat for a feast fit for a queen!.